There are many benefits to being fit ‘n right. Personally, as a lover of sports, more specifically football, I need to stay fit so I can still run with younger players and remain competitive. But, more than the need to keep fit, I do feel more alive and energetic when I am fit. I usually do a few push-ups a day and have been doing this regularly since April. Aside from that I used to play football on a regular basis and even played competitively for our football club Marikina United. I have always thought myself as a pretty fit person. *Measure up and see that he’s got the right body mass index (BMI). Now, as you read these, I know that for those who are not so much into exercising, they may seem like impossible goals and instead of motivating you to exercise more, they make you want to throw in the towel. But, you can always look at it another way, that is, to see all of them as a challenge. And that is how I saw them. So right now, I am upping my number of push-ups a day and since the Dare to be Fit ‘n Right event at Taste Asia at the SM Mall of Asia, I have been trying to do forty push-ups straight. I haven’t successfully done it without stopping but I have been making it up to forty! Talk about being dared to be fit and right. For those who are not very athletic and not into exercising, Coach Jim shared the four-minute workout, a.k.a. the F.I.T. (Fast Interval Training) workout which combines different short exercises (plank exercise, squats, push ups, lunges, crunches, side plank exercise - see video demo below) and it lets one burn 400 calories during exercise. Now, the great thing about this exercise is that calories continue burning even when a person is finished with the 4-minute workout! 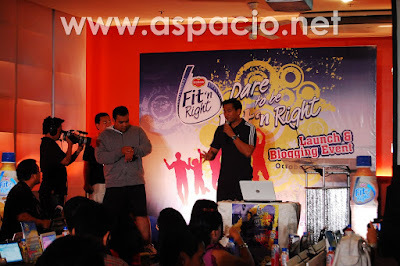 To demonstrate this, a the launching of the Dare to be Fit ‘n Right campaign, a guy was asked to do the F.I.T. workout while wearing a calorie counter watch. During the workout, the calorie counter registered almost 400 calories burned and the number of calories continued to increase to almost 800 calories ten to fifteen minutes after. This is a breakthrough because usually, a person running on a treadmill for an hour only burns 200 calories. So why go the long route if the goal is only to burn calories? In addition to all these, drinking Del Monte Fit ‘n Right two hours before the F.I.T. workout or any kind of exercise, will speed up your metabolism or, in other words, help you burn fat faster. The reason is that Del Monte Fit ‘n Right contains L-Carnitine which helps burn fat. It increases the use of fat as an energy source by transporting fatty acids into the mitochondria, where they are ‘burned’ to release energy for body functions. Del Monte Fit ‘n Right also has B Vitamins 1, 6, 12 to help speed up metabolism. Del Monte Fit ‘n Right is so consistent with their claim and their advocacy that they organized the “Dare to be Fit ‘n Right Fun Run 2009” which will be held on November 22, 2009 at the SM Mall of Asia (you can register here). This event is not only for runners but also for those who want to help typhoon victims because this Fun Run is for their benefit through the SM Foundation. The race mechanics are available in the photo below. If I did not have a schedule on the 22nd of November I would surely have joined the Dare to be Fit ‘n Right Fun Run 2009. But I need to preach that Sunday morning in our church so my contribution is spreading the word about the Fun Run. So what are you waiting for? Get your supply of Del Monte Fit ‘n Right and start exercising. Be a fan of their Facebook page. Better yet, exercise with other advocates and join the Dare to be Fit ‘n Right 2009 Fun Run! I like the post, inspiring to do running or boxing again... I havent since the start of the year. If you want to gain weight, what's the good alternative for push-ups? I am aware push-ups are great exercises for your chest but for ectomorphs like me, the exercise burns a lot of calories. Yes, nice post you've got here. This is helpful. Fit 'N Right Four Seasons is still my favorite..been drinking it even before the bloggers event. Coupled with Coach Jim Saret's regimen I think everyone can be fit soon. Thanks Jeff for the guidelines..I was a soccer player in college too hehe. I hope they come out with a sugar-free line soon, a lot of my family members are diabetic and I'm sure they'd love to try the FIT workout along with Del Monte Fit 'n Right. How does it feel to be the first one to finish the FIT regimen during the event? :) It looks like most of us, (in a way) became more health conscious after that night. i WILL do this!!! i think i am really feeling the effects of my weight gain and i have to actively do something about it. hopefully this change in lifestyle and habits makes a big impact in my health. Wow, I did not realize that you are so health conscious. Anyway, that's good, it does dare me to exercise more. Pare, kailangan ko na talagang mag-exercise. Salamat sa paalala mo. Hi Jeff we can be running buddies. i run every suturday and sunday morning and even swim twice every two weeks! it a simple way i can make my body fir and right! @Jennie: (hugs) c'mon let's play badminton na. @aeirin: That's a great idea. Great chance din to bond together. @Between Bites: You box pala? Anyway, you do look athletic. @SurvivorDean: Push ups do burn a lot of calories but maybe you can try increasing protein intake. Without trying other exercises but doing regular push ups, you may gain weight by increasing muscle mass in the chest, shoulders and arms. @Sire: Talaga? I didn't know you played soccer! @edelweiza: Mahirap talaga i-discipline ang sarili. I also struggle with that. That's why this campaign is so helpful - it's fit 'n right for us who want to be fit 'n right. @Wendy: I hope so, too. That may increase their target audience. @Dani: Hindi naman (blush). Normal lang naman BMI ko. I don't like to be big and all bufffed up, mababawasan ang agility. @Paolo: It feels great. I really enjoy any challenge. It was nice seeing you again, too! @Ria: Take it one day at a time, you can do it! @The Insider: I'm not really that health conscious. I just enjoy sports. @Carl: Sure. Medyo matagal na ako di nakakapag jogging. @Lhan: Buti ka pa may regular schedule. Ako natigil na but I hope to get back to running and playing football again. whoa! ang galing magpush-up! hands down sa vids! wow ang hirap ng routine mo a. Good job on the video! I can follow along to do my own exercise. Are those the only exercises that I can do? Aren't there other routines I can use in the FIT workout? Thanks for demonstrating it on video. I'm more of a watch 'n learn type of person. But I hope to become a fit 'n right type soon, hehe. pag may mga ganyan ulit next year sabihan niyo 'ko ah. What if a person is really fat? Are the exercises easy enough for those who need to lose a lot of fat? That 4-minute workout is interesting, I want to try it. Do I still need to go through a diet if I try this? @Imelda: The exercises can be done at your own pace. As you progress you can also increase the frequency and the speed of each routine. @Janice: Go ahead, give it a try! Exercise?dream ko lang mging fit at mwala taba ko haha.right? Great post! Your explanation about the need to be fit and right is clear and convincing. I agree with you that it is important for any person, both men and women to be fit and right, to be healthy. The alternative is to have a weak body which will result to a weak mind, thus sickness will follow. As the saying goes, health is wealth and is tax free. This is not an endorsement for Del Monte, but I believe drinking Fit 'n Right helps to have a healthy body since it is made from natural ingredients. That's the reason why I drink Fit 'n Right everyday. Not only me, but my 7 year old daughter also. As the commercial of one drug company says in Pilipino, "Bawal magkasakit." Therefore, your post about regular exercise to be fit and right strikes to the core. For our health and for longer life, exercise to be fit and right. Nice to see a post about how to stay fit and healthy. I've been a soccer player throughout my elementary, high-school and college days, but ever since I started working, I haven't had a chance to play again. With this post, I'm more inclined now to push myself and pursue other sports activities that will keep me healthy. Sabi nga nila, health is wealth! I'm not able to much exercize with having seizures that come on at anytime.I do the best that I can. My doctor advised me to lose weight, but unlike you, I can't do tough exercises because of steel chains embedded on pelvic...guess will try "Fit 'n Right sans the heavy exercises. Keep healthy! I wish I could do work out everyday... Nice job! Nice drink! Very interesting post, i wanna try this Fit 'n Right to be Fit all the time. Good luck. Best of luck with your fitness challenge. I admit that I'm so unfit. And I hate being unfit... just a few steps on the stairs and I'm already panting like crazy. I think sport is an important thing to do. and running is a sport of the cheapest and the simplest thing to do for people busy with work. what a great idea! very inspiring indeed.....thanks for sharing! I was very fit when I was younger. I ran two marathons and crossed trained on bike and cross country skis. Although I'm much older, I still have hopes of getting fit once again. Even thought I consider most of those things that a person MUST be able to do before being considered to be in great physical condition to be utter nonsense, it is good to set goals. Therefore, I wish you well in your endeavor. Very interesting post, I don't know anything about fit n Right Del Monte until now. Your posts open my mind to it. I am aware that I gain weight and this is the best thing for me to do, to exercise and be healthy. Agreed, we need to stay fit for all our lives. :) I am a basketball player too and I couldn't agree more that we need to be fit and ready all the time. Wow! You used to play on a regular basis for a football club? Awesome. Then you must be pretty fit huh. :D I do push ups too...but once in a blue moon. Perhaps I am just too plain lazy. This is all very interesting but personally is not something I will ever follow...I am not an unfit person but certainly do not fit into the category above either. I maintain a healthy lifestyle with homegrown organic veg and fruit and cook wholesome meals...I have an allotment which keeps me busy and get's me out in the fresh air...I do plenty of walking and enjoy doing yoga...I feel healthy and well in myself and what I do fits in with my family lifestyle..I don't think there is much point in being super fit if you have no time to enjoy yourself after and I certainly wouldn't if i tried to do all that you have written about. However for any who do wish to hit the targets I wish you all the best of luck!! Oh and I can mange 30 push-ups without stopping!! It is so hard to stick with a program... well done. I've been trying to stay motivated to get my last 8 lbs of baby weight off... bootcamp, stairmaster, push ups, lunges, sit ups... oh my! I read through the list of things you need to accomplish to consider being fit. That's quite a challenge and I wish you the best of luck with it! I take Fit n Right too and I'm working out again, Hopefully I'll reach my target weight in 3 months. That's a great idea. I guess it is better kaysa mag workout. I'm too lazy to do it. I'm looking forward to try the pineapple flavor as well. First step, Fit 'n Right ... Second step, Mr Universe! Bring it! Given that standard, I am surely not "fit." I'm not sure how many people beside high-level athletes and fitness trainers could successfully achieve all of those marks. Nonetheless, the goals are worthy benchmarks for those interested in achieving them. I'd do better writing about sports. Good luck reaching your fitness goals. Fitness is such an important aspect in life. I think it makes you better at everything else in your life - it makes you feel great! Some of those goals are are attainable for me right now, such as the push ups, benchpress, and basketball throw. I definitely would have trouble with the jumping, due to my stature (I am just a little guy). All in all, good goals to set for a total body work out, although I did not see and mention of core training such as crunches, sit-ups, etc. I congratulate you on your fit program.So many of us should follow your lead.Good Luck. wow! astig! I might dare to be fit again... this post is inspiring!You're doing great! Keep it up! Great information! Good luck in getting yourself fit. Hmm I have to admit I don't keep that fit, although skinny and in relatively good shape for my age I can see it would have many advantages doing more. I remember those difficult lunges and crunches from my days in sports. How nice it would have been to have Fit 'N Right back then. I'll have to look into this product, because with the extensive cycling that I do it could be a perfect match for me. Thanks. You go Jeff!! Fit 'n Right sounds like a winner program! Hey Jeff, I´m sure you´re right... and fit too, of course. Even though I recognize the brand (Del Monte) I never heard about this product, or perhaps it has a different name here in Portugal... I´m not sure. Due to another wrist surgery I haven´t been able to ride mi bikes and I´m looking forward for that moment... but to be true I believe that 4 minute training isn´t enough. Is better than nothing but it isn´t enough. I prefer to have fun instead of counting calories, this way it´s easier to keep exercising for longer periods of time and consequently burning more fat... I´m sure that´s what most people want, isn´t it!? I knew nothing about this product until reading your post. It sounds like a great thing. Good luck with it! As people approach New Years, more and more people will be looking at goals to set for being fit and you've provided a good list. It will be interesting to see how many of your blogging friends take up some of these goals, and perhaps more importantly, how many of them actually follow through and achieve these goals. I hope you write some follow up posts. I'm so glad I ran across this post. I have recently begun an exercise routine trying to get in better shape. I'm going to give the Del Monte fit n right a try. I'll let you know how I progress. This sounds great and would be of help to my autistic son, I would say. nice post about being healthy. I myself patronize fit n right fruit snacks and beverage, more power! For me becoming fit has always been a challenge. I used to walk a few miles each day and found that along with eating healthy allowed me more energy and in addition to losing weight, I felt much better. I think it's all in the mindset as well. Great article. I didn't know about Fit N Right. I already knew that I was way out of shape but the list detailing what one must be able to do to be considered in great physical condition proved it! If I could accomplish 1/4 of that I'd be happy. Fitness, by any and all means available, is a goal all humans need to set for both health and happiness. If Fit N Right helps achieve those goals, then it's a great product! Interesting post. Loved the video. I'm going to give the exercises a try. I've never heard about the the drink but I'll look into it and maybe give it a try. Wow. Those goals are awe-inspiring. What's even more amazing is that I think I used to do some of them! Having four kids really wipes a gal out! I wish you great success, Jeff! The fat-burning qualities of Fit 'n Right look great, hehe! I'll have to look this up. Your in great shape! Good job! Perfect timing. I just started a new exercise program and I will now add this drink to my regimen. Sounds great. You need to be fit and right in order to make the most of your life. If you are not healthy no matter how wealthy you are, you will never be happy. I tend to do a quick work out at night. Something that is only 15mins long but is done nightly. I'll do 25 push ups rest a minute, 25 curls, rest a minute, 25 lunges, rest a minute and finish off with 25 butterflies. It's a quick workout but boy do I feel it and all in about 15 minutes. Wow if I can do a 4 minute exercise routine and get fit, you can count me in. I will have to get some of Del Montes new drink next time my wife goes shopping. I know the older I get the better I need to take care of my body. Thanks for the post. Good luck! Love the post. I'm one of those who are motivated, not discouraged, by hard goals, so I understand exactly! Those goals sound extremely intimidating. I don't imagine I could ever keep up with them. Great program, and so inspiring! Best of luck (and endurance) in your fitness journey! Jeff wrote a pretty good article. I particularly enjoyed his sharing of his personal routine which really shows how far he has to go to attain total Fitness. Personally, I use free weights and prefer to run outside over the treadmill routine. i started to get fit too and got some diet on my menu in preparation for the holiday feasting lol! that 4 min workup is great! I know I felt a lot better when I was in better shape. Good luck with your fitness goals! This sounds wonderful. Being fit is also an excellent way to keep a fresh, optimistic view on life. Napagod ako watching your video! Hahaha...but it was good because it refreshed my memory of what Coach Jim taught us that night. I think I should do this workout on days when I can't do yoga. The plank and side planks are familiar to me as we do this in yoga. The pushups too. But the crunches and squats are new routines since we do something different to strengthen the core in yoga. Thanks for posting this, Jeff! Fit n Right was the fave drink of hubby when we were in the Philippines.. and i liked it too! the 4 season flavor. I'll try this exercise. Thanks for the clear demo! Wow what a great video and also a great drink.. My son is a skate boarder and I bet he would love the drink too.. good luck! well, for me its too hard to fit 'N Right especially if you realy love to eat like me,but if that Fit'n Right works why not try it. football= fit 'n right...LOL. not to mention fabulous!!! I am an avid runner and veteran road cyclist. Your post was most impressive. I have never been a fan of sport drinks personally but your post has definitely peaked my curiosity with this Del Monte's Fit'N Right drink. Good luck on efforts in this contest. Aysus! I believe in exercise for fitness, but you have a big challenge for me. Hehe ... at least I jog and walk an hour each morning. Hmmm ... but maybe some upper body exercises might be good also. Well, what my kids can't I can: touch my toes. IN fact, I can lay my hands flat on the ground before my feet. The result of lifelong ballet. I wish you lots of fun and success! thanks for sharing the video. four minutes of workout should not hurt my everyday schedule. I will bookmark this post. Looks interesting, I might give it a go - anybody know of an online store that carries Fit n Right? Hello Jeff. Thank you for all the info that you shared on how can one actually be referred to as being fit. They certainly made me think. Great to see you at the Red Ribbon event earlier and you are indeed looking "fitter" than ever. Jeff I think this is wonderful info and of course it's absolutely wonderful to be fit. Having said that, I would NEVER under any circumstances consume Del Monte fit N right. For one thing it contains an artificial sweetener, Sucralose,which is broken down "into small amounts of 1,6-dichlorofructose, a chemical which has not been adequtely tested in humans." It is also harmful to the environment. Sugar and artificial chemicals do not help anyone become fit or healthy, they do the opposite. Fresh, raw REAL foods create health. Good luck to you, my friend. I love Fit n right :)Not only because it helps you burn calories but because it tastes good! Great! Thanks for the 4-minute power workout! I am so desperate to be Fit-N-Right! I started to work out with gym recently, to stay fit-n-right is awesome! I congratulate you on your fit program. I should follow your lead. It's great to know another sports fanatic from different parts of the world ! Good for you to be Fit 'n Right!' & spread the message and importance of health, sports and fitness. From a sports science, marathon runner and sports photographer perspective, I relate easily to your exercise routine and I wish you all the best to be fit n right ! wow! may demonstration :) parang gusto ko muna unahin un first 2 exercises. hehe saka na ulit un 2 hehe.. gudlak kuya jeff! SO muchnew and challenging info! Thanks for this post, will try to get back to working out! Nice post. This is a great advocacy! You have good site, my friend. Good luck to be fit! It's nice to visit here again! This is a great post about being fit. I am challenged to start working out again. Thanks! It is right to be fit. I will try to follow along your video, very helpful post! magkano bayad ng fit-n-right sa endorsement ni Albert Martinez? sinubukan ko din ito, effective nga.naiba ang pakiramdam ko after this workout. Go kuya Jeff! Feel and Be Fit 'n Right! It's the right to do it, and it's time to be fit. Na-inspire naman ako sa post na 'to kuya! To be healthy (always) and fit is my priority din now. I will venture also for new sports next year. It's always challenging to make time for workout in my already busy schedule. I love to run, but didn't realize that I could burn more calories by doing various exercises in 4-minutes! This gives me no more excuses to not workout. I consider myself dared to be "Fit and Right". this is one tough regimen but I'm sure it can be done. commitment to get fit is all it takes, and you must have it in you. unlike me, even if I'm a SAHW exercise is always on the last of my priority. it's my attitude towards fitness that hinders me from committing. I have hypertension (I've had it since I was 21) and this should really push me to go for it, but I'm stuck with my once a week gym time for now plus I do indoor walking with weights once a week using the Leslie Sansone video. I know that I should be doing more but I'm lazy hahaha. Wow if doing those exercise in just a few minutes burn that much it makes me wanna do it too. It takes a lot of hard work, will and determination in order for one to be physically fit. Diet and exercise was once neglected by yours truly. Until I suffered from hypertension. Looking back, that's where I realized how unhealthy my life was. No healthy diet, no regular exercise. Now I make it a point to do regular walking despite my tight schedule at work. I keep watch of my diet and do away from unhealthy foods. I should be doing more but like Juliana, I am too lazy, LOL! But I want to be Fit N' Right for my Prince so i need to double my effort ;-) He has been encouraging me to be consistent with my push-ups and I am determined to do just that! Wow! That was great Pastor Jeff! In fact when you demonstrated the F.I.T workout in one of the youth service at the church we were all sweating after the two minutes workout how much more if we try the four minutes for sure the end result will be “ we are all catching our breath”. Thank you for posting this it encouraged me to continue my plan to be “Fit ‘n Right for the upcoming 2010”. One thing I love the Del Monte Fit’N Right pineapple. Great post! I will try to do this exercise. nice workout. i will try this tonight. Fit 'N Right really works, and this man can prove it, He knows a lot of sports and he can do this because he's fit, and fit n right helps him. Pastor Jeff! just always be fit in right..! :) take care! the prodigal son of SBC... coming soon! This is a very challenging post. I always thought of myself as fit but after reading the list you shared, I second guessed myself. Now I will dare myself to be fit! Is the drink you are prmoting available in New Zealand? I found this blog through a friend, I have been reading your latest posts, I think this is an interesting site. You even have videos. Nice! Go Go Go Jeff!!! Suportahan ta ka! i so wanna be fit n right but i cannot even follow your routine hehehe goodluck on me waaaa..
Nice! My family and I are trying to be much healthier. We exercise together and eat healthier foods daily. Jeff - This is an excellent post on the importance of staying fit. This is something that's a must for ones entire life. Staying fit will help you live longer as well. I'm in my late 50s and a healthy diet and exercise is part of my daily regimen. I salute you for your determination to stay fit and help others in that endeavor. God bless you, Jeff as you strive to be fit and right! i love the fit 'n right drink, especially four seasons. BUT! i don't wanna be fit if that's the definition of fit. like the??? Wow! I like this post. It is really hard to allot some spare time for exercises. Everyone is always lacking time or in a hurry. The F.I.T workout is the solution for those who is busy as always and do not have the time to exercise. Plus, it is nice that there's such a product like Fit n Right. Ingredients are natural and therefore healthy to the body. Thanks for the demo and the post. Thank you for daring us to be Fit 'n Right! This is what we need. Someone to remind us of the benefits of exercising. Your demo helps a lot. I like the FIT exercise because it can be done in just a few minutes. And also, the Fit 'n Right drink is just fit and right. The ingredients are natural. Natural means healthy to take. Keeping fit by doing some kind of exercise every day is important, but not everyone has the time to do sports. There is a lot that you can do in your everyday life to get some kind of excercise rather than none, such as walking instead of taking a bus or walking up and down stairs at home, as I do. My favourite kind of exercise is swimming. 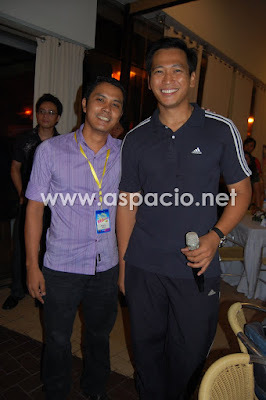 Kuya Jeff, kailan ka ulit magp-practice with us? Wala pang tournament e, pero I'm glad that you are trying to stay fit. Sana makuha nating sponsor ang FIt N Right sa team! Hehe. Great campaign! I hope you dare a lot of people and they start working out and drinking Del Monte's Fit N Right! Hello po, Pastor Jeff! Nagulat ako sa demonstration niyo. Sinubukan ko mahirap pala. Iinumin ko na lang yung fit and right kahit walang exercise (lol). You have a very active blog, Jeff. It was nice to see you last week at our meeting. I hope I still have the strength to exercise like how you demonstrated, but I think I don't. But my therapist gives me some simple exercises with my condition. Hey! I haven't blogged for along time, that's why I was surprised to hear from you. I hope you win this contest. Great post, by the way. Very challenging! Thanks for frequently visiting my blog and for keeping me linked. I've been offline for a long time, but was awakened by your message. May you win this contest! Good luck to you and to Del Monte Fit N Right. Good luck, my friend! It feels good to be fit. I was impressed by your video. Wonderful job! This season is much colder than usual. Exercising can help us heat up and lose calories. I learned so much from this post. Ang galing ng video! Sana may background music, "Let's Get Physical"
Keep up the great job, Staying fit is also staying healthy. Very impressive how you mange yourself, sports and work plus staying fit. Hi! That 4-minute F.I.T. (Fast Interval Training) workout is a must-try for my brother. I'll give him the link to this blog. Thanks for the demo! :) and Good luck! What works great here is your video; you made me feel it is possible! Ah well - a life of 39 years; and I didnt do anything to keep my body fit. But it did change since October; started working out. hi jeff! your post is very informative and inspiring as well. it's a wake up call for me to have a healthier lifestyle specifically to get into exercise. your post is very inspiring especially for someone like me who's starting my own program of getting back into shape, i'm into my fourth week and i think i'm doing fine. I'm a sporty person but after marriage i stopped doing it. Now I just content myself with getting back into my walking exercise of 2 kms. a day, hope i can fit it in my busy sked. keep up the good work both physically and spiritually. Your post here is an inspiring one. I tried doing a routine workout but because of works and other stuff it seems that the supposedly routine becomes occasional. To share one good way to maintain your muscles if you're not having exercise regularly is to intense your muscles once in a while in that way the muscles will still be in good condition. That's what I've learned from my sensei way back college time. Great writing! Maybe you could do a follow up on this topic?? Blog Contest or Migrate to Wordpress First?